Home › Detoxification › Which Probiotic Should You Be Taking? Probiotics are those naturally occurring “good” or “helpful” bacteria found in the body and probiotic supplementation can be beneficial for you, even if you don’t have a digestive problem. Many over-the-counter probiotics, at best, may have no effect because they may either not be the ones for you or simply don’t work because they are destroyed by your digestive system before they can begin working. Just like with shoes, it’s important to find the right fit for you. Why Do I Need Additional Probiotics? The most common factors that require people to help out their bodies with probiotics are poor food choices, antibiotic and NSAID use, alcohol consumption, and various viruses and illnesses. While antibiotics prescribed by your physician may help cure infections, the unintended consequences can result in a wide array of health problems because antibiotics are non-discriminant in the bacteria they destroy and can reduce the body’s natural, essential probiotics. Do you ever eat food with artificial coloring? Some of these ingredients are antibacterial, which means they can destroy all kinds of bacteria and alter the balance of our intestinal bacteria. A less-than-ideal diet can exacerbate a bacterial imbalance because pathogenic bacteria love to feed on sugar from the carbs we eat (often in excess). Chronic alcohol consumption (typically more than a few drinks a day) can also kill off bacteria in our bodies, leaving the door open for harmful bacteria to repopulate in its place and further skew the balance between good and bad bacteria. Certain viruses, called bacteriophages, infect and kill friendly bacteria and are commonly found in people with Crohn’s disease, ulcerative colitis, and irritable bowel syndrome. How Can the Naturally-Occurring Good Bacteria Get Replenished? Eating fermented foods on a frequent basis is one of the best ways to ensure that the digestive system is always repopulated with healthy bacteria. Most of us do not regularly eat fermented foods, such as live culture yogurts, buttermilk, sauerkraut, pickled vegetables (pickled in brine, not vinegar), sour cream and even unfiltered beer. Yogurt makers are increasingly trying to market probiotic-enhanced yogurts and claim a beneficial effect based on the studies they perform. During these studies, participants were typically consuming the yogurt throughout the day to achieve the benefit. Although yogurt does provide beneficial bacteria, just having a yogurt in the morning for breakfast is not usually sufficient as a therapeutic dose of probiotics. This is very similar to vitamin C intake. A medium orange can provide about 45 mg of vitamin C, or about half the U.S. recommended daily intake. However, there are certain times that our bodies could use much more than that to reach the therapeutic dose that the body needs. Since none of us would want to eat a dozen oranges or a dozen cups of yogurt, probiotic supplementation is a much easier and controlled solution. Yogurts contain some of the same strains of probiotics found in high-quality probiotic supplements, but they simply don’t contain as much bacteria as the body could use for optimal health. Since most of us do not have an optimal diet that properly supports intestinal bacteria on its own, we can benefit from supplementation with a high-quality probiotic supplement that gives us a reliable, controlled, and effective daily dose. Which Probiotic is Best for Me? Over the past 20 years, extensive research has uncovered numerous potential uses and benefits of specific kinds of probiotics for specific health concerns. One of the key differences between a quality, high-end probiotic and a discount, grocery-store version is that the higher-quality probiotics are usually made with acid-resistant capsules and often feature pH-targeted release mechanisms that ensure the probiotics are released in the digestive tract at the right time – so that they work. After all, what use is a probiotic if the bacteria are killed off by your stomach acid? Premium probiotics also tend to include more organisms per capsule (for example, 20 billion instead of 1 billion), which helps to guarantee that more bacteria reach the digestive tract and are able to successfully repopulate. Another key reason to choose a quality probiotic is that they usually have carefully-selected strains, as opposed to the “one-size-fits-all” approach commonly taken by inferior probiotics, which specialize in treating particular health problems. Here is how the right probiotics can help with some commonly experienced health issues. Probiotics can be of great help in keeping your digestive system running smoothly. Studies from The American Journal of Clinical Nutrition and Nutrition Journal found that consumption of probiotics resulted in a significant improvement in severity of constipation, consistency, and colonic transit time (how long it takes for food to travel through the digestive tract). The researchers observed less severe and moderately severe constipation in the participants who took the probiotics, as opposed to those who took a placebo, and concluded that they have a beneficial effect on gastrointestinal symptoms of patients with chronic constipation. A study from the Journal of Gastroenterology and Hepatology discovered that probiotic therapy lowered the abdominal pain and discomfort that is often associated with digestive issues, such as irritable bowel syndrome, and also led to an improvement in bloating and distension, sensation of incomplete evacuation, passage of gas, straining, and bowel habit satisfaction. Those looking for a probiotic to aid with digestive concerns, such as those mentioned above and others, should look for one that specifically contains the strains Bifidobacterium lactis Bi-07 and Lactobacillus acidophilus NCFM. Multiple studies, such as a recent one from Journal of Clinical Gastroenterology, highlight these strains for their ability to help with digestive disorders. Lactobacillus acidophilus NCFM, in particular, is one of the most thoroughly researched strains of probiotics and is also recognized for being one of the best probiotic strains for surviving stomach acid and properly adhering to the intestines. Probiotics can also play a key role in maintaining a strong immune system. Certain bacteria in the gut seem to influence key aspects of the immune system, such as correcting deficiencies and increasing the numbers of certain T cells that scan for cellular abnormalities and infections. A study published in Journal of Science and Medicine in Sport found that probiotics containing Lactobacillus gasseri and Bifidobacterium longum can reduce the occurrence of colds and gastrointestinal infections. During the course of the study, 14 of 30 participants who were receiving probiotic treatment never experienced a single upper respiratory tract illness or gastrointestinal episode during the experiment. This is impressive when compared to the just 6 of 30 who avoided illness among the group that received placebo supplementation instead. Even if you do come down with a cold, a study from Clinical Nutrition claims that probiotics may shorten its duration. The study concluded that taking those same probiotics, for at least 3 months, significantly shortened common cold episodes by almost 2 days and reduced the severity of symptoms. Although antibiotics can be important for medical treatment, they indiscriminately kill both good and bad bacteria and can negatively affect our metabolism, pathogen resistance, regulation of immune responses, and other important functions. The result can be acute or chronic disease in some individuals because the changes that antibiotics cause in the gut can have significant adverse effects on our health. When antibiotics kill too much good bacteria, it can result in the development of a dangerous, disease-causing strain of bacteria called Clostridium difficile, also known as C. diff. This bacterium is often directly responsible for the most common antibiotic-related health concern that people experience – diarrhea. In a study published in Therapeutic Advances in Gastroenterology, certain probiotics may prevent diarrhea by maintaining the bacteria of the gut, supporting carbohydrate fermentation, and by competitively inhibiting the growth of pathogens. To combat the adverse effects of antibiotic use, the study recommends using a probiotic that contains Saccharomyces boulardii because it has been thoroughly researched for use in antibiotic recovery. Not only can it prevent and treat antibiotic-related diarrhea, but the fact that it is actually yeast means that it is less affected by the antibiotics. Using the right probiotics can prevent many of the side effects of antibiotics and keep our body operating the way it is supposed to. Recent studies have suggested that probiotics may even be able to help relieve seasonal allergies (also known as hay fever). The theory behind this concept is based on what we know about probiotics’ effect on the immune system. Allergies are essentially a misguided flare-up of the immune system in response to relatively harmless pollen or other allergens. Probiotics may help by changing the balance of bacteria in the intestines in a manner that might prevent the immune system from overreacting to the presence of allergens, which may help reduce allergy symptoms. Studies from International Forum of Allergy & Rhinology and North American Journal of Medical Sciences seem to confirm the theory, but even the lead researcher from the study in International Forum of Allergy & Rhinology concedes that more research is needed to be certain. The study from North American Journal of Medical Sciences notes that although probiotics may have an important role in the prevention and treatment of allergic rhinitis, selection of the most beneficial probiotic strain and the timing of supplementation still need to be determined. Although it is too soon to know which probiotics can help us with allergies, if any of them truly do, keep your eyes peeled for future research that gives us the answer. Until then, it gives a little more motivation to regularly take our probiotics because they may be helping in more ways than we think. Some ask when the best time to take probiotics is, but it really depends on each particular person, what they are taking them for, and a wide array of other personal factors. For most people, taking probiotics with meals is ideal. Although there is little research on the best time to take probiotics, most physicians feel taking probiotics with a lighter meal with a bit of fat content is ideal. Probiotics are living organisms and are very sensitive to the acid and digestive juices within the stomach. When food enters the stomach, it decreases the acidity of the stomach. As long as it does not sit in the stomach for a long period of time (such as with a heavier meal), it can be a helpful transport for the bacteria to effectively reach the lower intestines. If you have any questions regarding the concepts discussed here or anything else, you can reach our customer service team at customerservice@oakwaynaturals.com or you can call them at 888-460-3091. 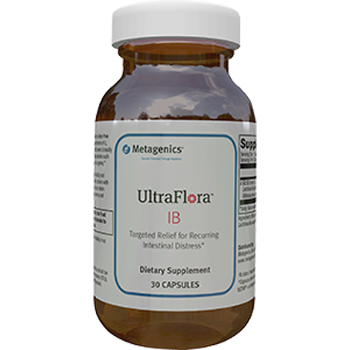 UltraFlora IB is a clinically-tested blend of friendly bacteria in a dairy free base. Featuring Lactobacillus acidophilus and Bifidobacterium lactis, this advanced formula is designed to address gastrointestinal symptoms such as abdominal discomfort, bloating, cramping, and urgency. Probiotics are those naturally occurring “good” or “helpful” bacteria found in the body. They are mostly found in your digestive system, but they don’t just help with digestion. The most common factors that require people to help out their bodies with the addition of good bacteria are poor food choices, antibiotic and NSAID use, alcohol consumption, and various viruses and illnesses. Eating fermented foods on a frequent basis is one of the best ways to ensure that the digestive system is always repopulated with healthy bacteria. Most of us do not regularly eat fermented foods, such as live culture yogurts (yogurt in the morning for breakfast is not usually sufficient as a therapeutic dose of probiotics), buttermilk, sauerkraut, pickled vegetables (pickled in brine, not vinegar), sour cream and even unfiltered beer. Since most of us do not have an optimal diet that properly supports intestinal bacteria on its own, we can benefit from supplementation with a high-quality probiotic supplement that gives us a reliable, controlled and effective daily dose. Over the past 20 years, extensive research has uncovered numerous potential uses and benefits of specific kinds of probiotics for specific health concerns. One of the key differences between a quality, high-end probiotic and a discount, grocery-store version is that the higher-quality probiotics are usually made with acid-resistant capsules and often feature pH-targeted release mechanisms that ensure the probiotics are released in the digestive tract at the right time – so that they work. Another key reason to choose a quality probiotic is that they usually have carefully-selected strains, as opposed to the “one-size-fits-all” approach commonly taken by inferior probiotics, which specialize in treating particular health problems. Digestion: One study discovered that probiotic therapy lowered the abdominal pain and discomfort that is often associated with digestive issues, such as irritable bowel syndrome, and also led to an improvement in bloating and distension, sensation of incomplete evacuation, passage of gas, straining, and bowel habit satisfaction. Those looking for a probiotic to aid with digestive concerns, such as those mentioned above and others, should look for one that specifically contains the strains Bifidobacterium lactis Bi-07 and Lactobacillus acidophilus NCFM. Immune system: Certain bacteria in the gut seem to influence key aspects of the immune system, such as correcting deficiencies and increasing the numbers of certain T cells that scan for cellular abnormalities and infections. A recent study found that probiotics containing Lactobacillus gasseri and Bifidobacterium longum can reduce the occurrence of colds and gastrointestinal infections. Antibiotic recovery: To combat the adverse effects of antibiotic use (which indescrimintately kill both good and bad bacteria, studies recommend using a probiotic that contains Saccharomyces boulardii, using the right probiotics can prevent many of the side effects of antibiotics and keep our body operating the way it is supposed to. Seasonal allergies: Recent studies have suggested that probiotics may even be able to help relieve seasonal allergies (also known as hay fever). The theory behind this concept is based on what we know about probiotics’ effect on the immune system. Allergies are essentially a misguided flare-up of the immune system in response to relatively harmless pollen or other allergens. Probiotics may help by changing the balance of bacteria in the intestines in a manner that might prevent the immune system from overreacting to the presence of allergens, which may help reduce allergy symptoms. Probiotics are good preventative and general wellness supplements. I hope we have showed you the importance of choosing a professional supplement that provides a controlled delivery of the right probiotic in sufficient quantities, whether it is for digestive, immune or even allergy-related health concerns. For the best all-around probiotic, I recommend UltraFlora IB and its clinically-tested blend of Lactobacillus acidophilus and Bifidobacterium lactis than can aid with digestion. If you are looking for immune system support or antibiotic recovery, you should try FloraMend Prime by Thorne Research or Saccharomyces boulardii by Pure Encapsulations. We hope this slide show was helpful and informative. Should you have questions, or suggestions, please feel free to fill out our Ask the Doctor form found at the Doctors Corner.